Approximately 22 inches / 56 cm tall. The grille cloth is not original. Tube complement: 6D6 RF, 6A7 mixer/oscillator, 6D6 1st IF, 6D6 2nd IF, 75 detector, 42 audio driver, (2) 42 push-pull audio output, 5Z3 rectifier, 76 shadowmeter amplifier. 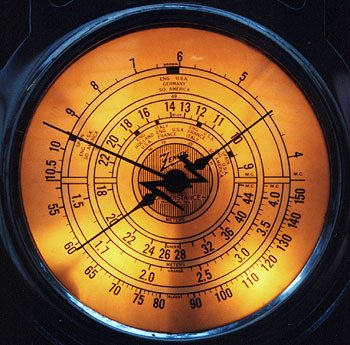 A closeup of the radio's five-band dial. The 0-60 "split second" scale that should be located at the periphery of the dial appears absent. Actually it's there, and can be just barely discerned in person. The scale, originally red, has faded to near-invisibility over the passing decades. From a 1935 Zenith brochure. 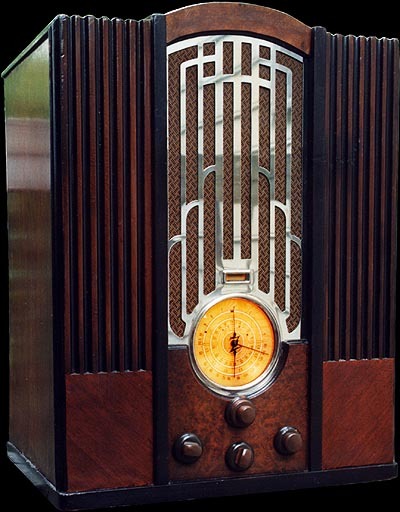 Note that this picture shows the radio with knobs like those on models 807, 808 and 809. I've not seen other 835s with these knobs, and most I've seen have knobs like mine. 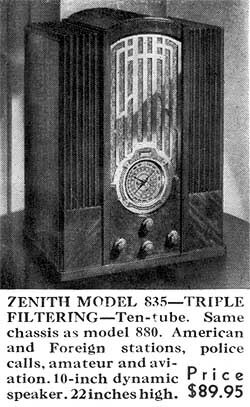 Therefore I conclude that my radio has the "correct" knobs, and that Zenith changed its mind about knobs for this radio before it went into mass production.